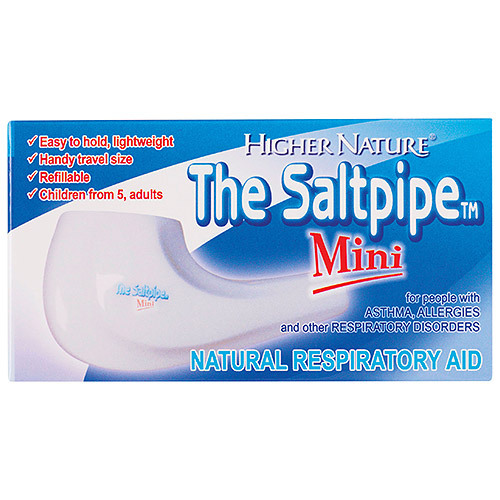 The Saltpipe Mini is a refillable inhaler that brings the benefits of salt mine therapy to your home. Its salty microclimate calms the cells of the respiratory system and induces their natural self-cleansing mechanism to help with breathing difficulties. Increased air pollution is contributing to a growing number of people suffering from breathing difficulties. Hay fever, asthma and other respiratory disorders are on the increase. The salty atmospheres of salt mines have been used for centuries to ease the symptoms of respiratory system disorders. A handy refillable inhaler that brings the benefits of salt mine therapy to your home. Its salty microclimate calms the cells of the respiratory system and induces their natural self-cleansing mechanism. The Saltpipe Mini comes with salt crystals from the Transylvanian Praid Salt Mine. The praid salt hill is a geological curiosity with approximately 3 billion tons of salt which has been mined since 2nd century AD. The salt`s curative properties are well known and used in therapeutic treatments facilities located in the disused parts of the mine. A disposable bag of salt crystals are placed between the porcelain filters of the device. When using the pipe, the moisture of the passing air absorbs the micron sized salt particles that then penetrate into your respiratory system to achieve the desired effects. The sodium content of the active ingredients induces the natural self-cleansing mechanism that flushes away impurities from the surface of the cells. Salt particles also mechanically clean the air passages. The effectiveness of the Salt Pipe has been proven in clinical trials. The Salt Pipe is a registered Class IIa medical device. The mini salt pipe has to be refilled with new sachets roughly every 6 months if used at recommended usage. Each box comes with 1 x Higher Nature Saltpipe Mini with up to 6 months worth of recommended usage. Miocene salt crsytals, composed of sodium chloride, magnesium and calcium. The active ingredients may last for up to 6 months under normal usage (15-25 minutes per day). Insert the mouthpiece and draw air through the inhaler, breathing normally, and exhaling through the nose. Prolonged inhalation is not required. Do not breathe out through the pipe. When you first use the saltpipe mini you may experience some coughing or sneezing as your respiratory system clears. When you first use the saltpipe mini you may experience some coughing or sneezing as your respiratory system clears. Always remove the salt bag before cleaning the Saltpipe Mini. Please see your doctor if you are concerned about the applicability of this product in relation to to your own condition. Below are reviews of The Saltpipe Mini - Natural Respiratory Aid -Refillable by bodykind customers. If you have tried this product we'd love to hear what you think so please leave a review. 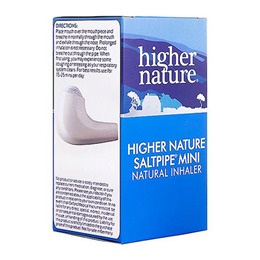 The Saltpipe Mini is a refillable inhaler that brings the benefits of salt mine therapy to your home. Its salty microclimate calms the cells of the respiratory system and induces their natural self-cleansing mechanism to help with breathing difficulties.